Me: Oh my goodness, congratulations! When did you get married? Friend: I didn’t. I just finally had to start wearing this diamond so guys wouldn’t disturb me in the supermarket. Friend: You know — so they know that I’ve been taken. Me: Been taking what? Benadryl? I discreetly gave Tiffany my gal-pal, the once over while wondering about the accuracy of her statement. Seriously? Yes, she’s attractive in that well-preserved apricot jam type of way, but really? Are there actually women who have so many men coming on to them that they cannot concentrate enough to knock on watermelons or end up rereading the same line of their grocery list due to the ever-present distraction of having to decline dinner dates? Who were all these males that Tiffany (and apparently others) were giving the proverbial (ring) finger to? I just had to find out. Me: Thanks for helping me with my research, guys! So what do you think about the Engagement Band? Guy: (Mid-20’s) Do they play pop-rap or alternative rock? Me: No, I’m talking about a real rock. You know, the kind women wear on their left hand to send signals to men? Guy: (Mid-40’s) The only signal I get is to take out the trash. Guy: (Early 30’s) Which body part does your wife wear the garbage thing on? I think mine’s got on a “mow the lawn” anklet. Me: Now now, there’ll be no strategic chopping off of appendages, please. Alright so do you find a ring on a woman to be a strong deterrent? Guy (Mid-20’s) You mean like Tide or Gain? Me: You just listen from now on, okay? Obviously my Jewelry focus group for men is going nowhere and the subject is getting more confusing, so bear with me as I change the format to . . . 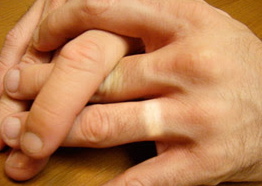 Symbolic — Since women are putting wedding rings on when they’re unattached and men are taking wedding rings off when in fact they ARE very married, nowadays this golden loop most likely stands for total random nonsense. Instead everyone should display Zoo ticket receipts. If you haven’t been to a zoo recently, then you’re unmarried. Trust me on this. Family Heirlooms — We get it, you want her to think you’re super sentimental. But Great Grandma Pearl’s dying wish was to be buried in her double strand of fresh-waters, so you goofed-up (big time!) at the funeral. Put ’em back, buster. Size — When ring shopping, she’ll try to convince you that the number of carats equals your amount of love. Tell her you need to think about that statement, but you’ll definitely give her “a ring” tomorrow. Then telephone her the next day and break-up. Earrings — Go ahead and summon up the courage to get your ears piereced together and even buy His n’ Her matching ruby studs — but when you’re brave enough to get hitched, literally link yourselves together thru the ear holes by sharing one hoop earring. It’s the modern day ball & chain. Ain’t nobody picking someone else up in the produce section now! Problem solved. If you enjoyed my “sparkling” sense of humor with this silly jewelry piece, please visit an oldie of mine RIGHT HERE about how women can convince a man that size really DOES matter. ← No Worries – – We’ve Got Your Back. If it’s a good deterrent I need some of that for my gym shirts. Haha!! Wait till you experience the spin cycle. I like the research project. Very telling on both parts. Men don’t really focus in focus groups and rings can be very confusing these days. Hmmm, you didn’t cover the actual promise ring statement. Men who give one and the woman who only wear it sometimes what does that mean? Sometimes I promise but I’m actually crossing my fingers? Women who give them to men, what dos this mean? Definitely won’t be getting any piercings ears or otherwise. I think I hear the the phone ringing . . . . .
hahaha, this made me laugh. But I still think that either way you wear a ring or not, guys would still hit on you. Maybe that applies to the rest of the female population – – but the only hits I get from men are a few lost souls who accidentally surf into this blog-site. 😉 Thanks so much for visiting!! LOL- i’ve definitely done this before. Saves trouble sometimes. Your comment about “total random nonsense” made me laugh. but you won’t need to do this anymore, right? Look at you – – All legit and everything. Congrats again, Diahann! I am totally killing myself laughing here! Just re-watched “Sideways” where the chick Paul Giamatti has the hots for wears a ring to keep the men at bay but his friend tells him that it’s just a front…. I wonder how we should factor in the new trend of tattooing the ring finger. New love, or old tattoo?? We’ll never know. Indeed! And that’s just the finger!! Sounds like there is a business opportunity there. I could be Rent-a-Husband. Just $25. Take me along to the supermarket with you. I’ll just give any guy the glance who is trying to pick up my pretend wife. For an extra $25, I’ll even make Husband Talk. I can say things like: Why do I always have to take out the garbage? Or don’t forget Kitty’s litter. i am tired of your cat peeing in my slippers. Or do we have to go to your sister’s for Sunday dinner? I want to stay home and watch the game on tv. Beside you know your sister can’t cook. HAHAHAHA!! My fave comment of yours yet! 1) I live in a zoo. 3) I’ll put back the banana then. 5) I face one way, you the other, link our ears and around we go …..wheee ! Ha… good one Steph! Reminds me of a Safeway in San Francisco that’s known as Dateway. I’ve heard they actually let you squeeze the melons there. The melons….hahah, roomie. Squeezing the Charmin was too tame.